Templates can make your life easier in two ways. First, there are hundreds of templates already in existence just waiting for you to choose them. Second, you can save your own custom templates either from your workbooks or by customizing a commercial template. If you’ve ever accidentally saved over a document you needed by using it to create a new one, or accidentally deleted long and complex formulas, you’ll appreciate these tips. By clicking on the File tab and selecting New, you’ll notice a variety of template categories to choose from. Click Sample Templates at the top to reveal templates already installed on your computer. The lower portion of the screen reveals the template categories available from Office.com. You can also type in search criteria into the Search Office.com field for templates. Create your work sheet or modify a template to suit your purposes. Consider creating borders around or shading cells that require data input. Click File, and then Save as… (or try the shortcut F12). In the Save as type field, select Word Template. Be sure the file saves in your templates directory. Close the file. It would be too easy to forget you were in your template, instead of a copy of it. To use the template, click File, then New. Click My Templates and you’ll find the one you created. Delete any additional work sheets, leaving you with a single work sheet workbook. Save the single work sheet workbook as a template (steps above). 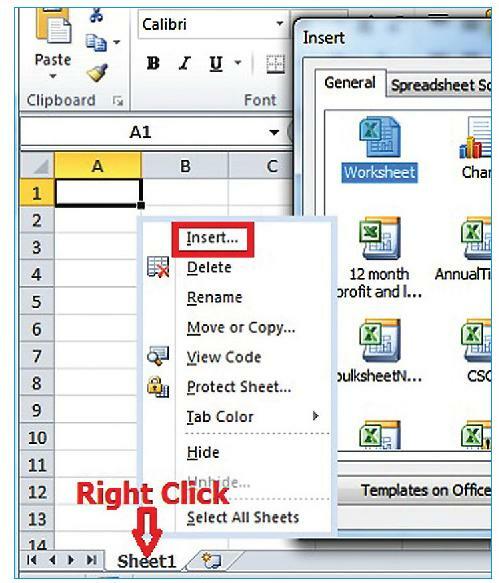 When you want to add one of those work sheets to your workbook, right-click a work sheet, and choose Insert. You will see your templates in the Insert dialog box. With your new templates, you can stop reinventing the wheel. Just do the hard work one time and reap the return year after year.